IDF feels like it has crossed the Rubicon in the anti-tank missile battle with the operational success of the 'Trophy': Senior IDF sources expressed immense satisfaction Tuesday from the first operational activation of the active protection system (APS), designed to supplement the armor of both light and heavy armored fighting vehicles, known as Trophy, this afternoon near the southern Gaza Strip border. An initial report into the incident shows that a Palestinian terror cell that got close to the border fence fired an RPG from close range at a tank that was carrying out a routine patrol. The system, which is fitted to the tank, immediately recognized the fire and fired a neutralizer which caused the rocket to explode in mid-air within safe distance of the tank. As a result, the tank incurred no damage and none of the soldiers within the tank were hurt. 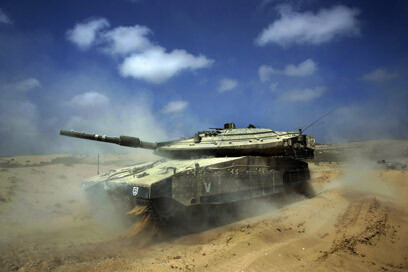 The IDF stressed that this is an unprecedented and historical event in Israel's Armored Corps and around the world. Above all this is also "a change in the equation in the southern sector and in the northern sector against the Hezbollah's anti-tank threat". A senior IDF source noted that "the system has proven itself above and beyond expectations and it is also effective against missiles that are larger than RPGs." "Just two months after it came into operational use the Trophy prevented injury among soldiers with unimagined success," the senior source added. "Investment in technological development that went on for years presented unprecedented results. This doesn't mean that tanks won't be hit in the future, but without a doubt this is a new method of dealing with the anti-tank threat." The Armored Corps technological innovation first made headlines two months ago when the IDF prepared a final test for the Trophy system, which was supposed to include a fully-manned tank. Following appeals from bereaved parents who lost their children in the Ze'elim disaster, it was eventually decided to avoid using live fire on the tank. The test, which was held under supervision and using all available safety measures was a success – and the system was immediately put into the mark-4 Merkava tanks. See all talkbacks "IDF celebrates Armored Corps history: Trophy system successful"